My friend Ben Claremont (Life in 360) just posted a review and tutorial for the 2017 Samsung Gear 360. His video demonstrates the Gear 360’s resistance to overheating (in cool weather), but points out the Gear 360’s flawed video stitching. As Ben mentioned, the 2017 Gear 360 has a strange video stitching issue. Briefly, the stitching will warp if anything crosses the stitch line close to the camera (if they cross far from the camera, it doesn’t seem to warp). It happens with both recorded and live video. Whether this is a problem depends on individual users’ preferences, but as Ben said, it’s less noticeable when you’re moving. (Note also that this issue does not affect the original Gear 360). I haven’t been able to test it on my Samsung S6 because mine’s stuck on Android 6 (I bought it used and it had a bad IMEI). Personally, I think the 2017 Gear 360 is a pretty good camera but as I posted about recently, if your priority is photo or video image quality, the Xiaomi Mijia Sphere 360 seems to have better photo and video quality for a similar price. You can also compare the 2017 Gear 360 and original Gear 360 here. As for compatibility, the 2017 Gear 360 is much improved over the original Gear 360, but compatibility with iOS is handicapped, with a lower photo and video resolution (until you stitch on a desktop). Moreover, it seems to keep crashing on my wife’s iPhone SE. On the other hand, the Xiaomi has even more handicapped compatibility with iOS (see my next post), a buggy Android app, no desktop software yet, and has no live streaming. – does it stitch photos on the camera? – if so, how fast is time-lapse? – does it support OSC properly this time? 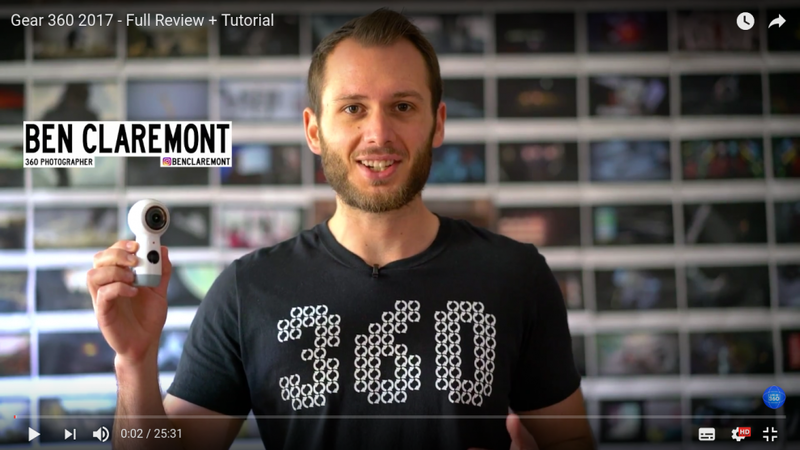 4K 360 consumer camera shootout – which has the best 360 video?